This spring, Vermont Center for Ecostudies will pilot their new citizen-science Vermont Vernal Pool Monitoring Project, or VPMon. Vernal pools provide critical habitat for a diverse assemblage of wildlife, from breeding wood frogs and spotted salamanders, to fingernail clams and fairy shrimp. Despite their important role, vernal pools remain poorly understood and face an uncertain future due to effects of climate change, airborne pollutants, and threats from development. 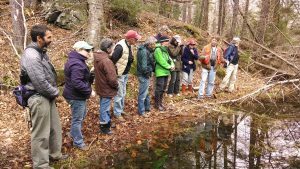 The goal of the Vermont Vernal Pool Monitoring Project is to address that gap in knowledge here in Vermont, while also engaging the public with these unique wetlands. Liza Morse, the ECO AmeriCorps Vernal Pool Monitoring Program Coordinator at VCE, will explain how the program works and how you can get involved, as well as train participants on project protocols. The workshop will begin with with an indoor presentation. Then Liza will guide us to a site on the adjacent Hogback Mountain Conservation Area where participants will learn protocol and precautions used in monitoring a vernal pool. Following participation in the workshop, interested attendees will be ready to go out and monitor vernal pools as VPMon citizen scientists themselves. RSVP REQUIRED online as space is limited to 25. Go to hogbackvt.org and click the Events button to get to the online registration form. Dress for the weather and walking on uneven and wet terrain.